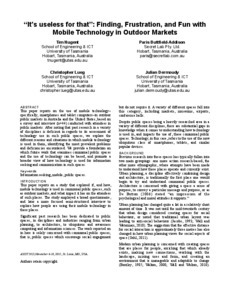 This paper reports on the use of mobile technology– specifically, smartphones and tablet computers–in outdoor public markets in Australia and the United States, based on a survey and interview (n=44) conducted with attendees in public markets. After noting that past research in a variety of disciplines is deficient in regards to its assessment of technology use in such public spaces, we explore the different reasons and situations in which mobile technology is used in them, identifying the most prevalent problems and deficiencies encountered. We provide a foundation on which future work that examines communal public spaces and the use of technology can be based, and promote a broader view of how technology is used for information seeking and communication in such spaces.